Raila Odinga addressing NASA supporters at Donholm on November 28,2017. After weeks of dancing with the public’s emotions, NASA chief Raila Odinga will not be sworn in tomorrow as he had threatened, after all. After a daylong meeting with his team, he backed down from his vow with a whimper. It was the first time a venue was being identified in the inauguration circus. The press conference was not attended by Raila, but it appeared that intense efforts by close allies, family, diplomats, business and religious sector leaders to dissuade him from the plan had borne fruit. Inside sources say Western diplomats led by American ambassador Robert Godec had cornered the former Premier on the oath. 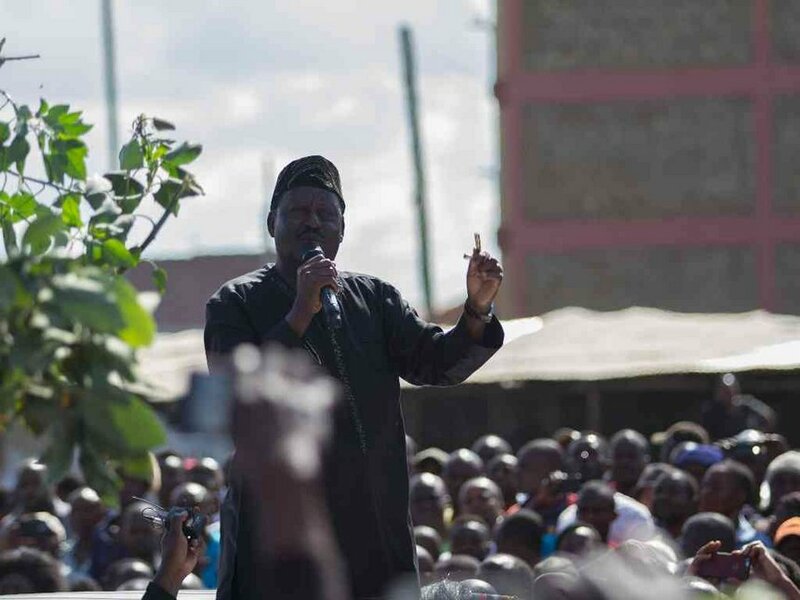 The family, led by Raila’s wife, Ida, had also flatly rejected the idea which Raila unilaterally announced two weeks ago on the road to Jacaranda. Impeccable sources told the Star how the swearing plan had strained relations within Nasa as all the other co-principals and the strategy team were uncomfortable. The diplomats reliably told the Nasa leadership that President Kenyatta had expressed willingness to engage on the reform agenda. The party said it was aware that many supporters who have been “eagerly waiting for this occasion” will be disappointed. It did not give any reasons for the “postponement” to an unspecified date or the next steps forward but said it would continue with “vigorous and prolonged resistance”. Raila’s threat to be sworn in had kept his supporters and the public on tenterhooks. But he was equally under pressure to call off the plans, which many believed he had been coaxed into by his more radical supporters. He was sitting on the horns of a dilemma: He was damned if he did and doomed if he didn’t live up to his threat. Torn between appeasing his supporters and securing his legacy, older counsel seems to have prevailed. While the country will breathe a sigh of relief, his ardent supporters will be asking many questions about the decision to back down – and the reasons for it. Although the State had threatened to arrest and charge him if he had gone ahead, others had dismissed the “high treason” interpretation of his intended action as immaterial. “We wish to reassure them that our resolve has not changed, specifically we need to reiterate that any national dialogue must have electoral justice on the agenda,” the party reassured its supporters. “We are not interested in sharing illegitimate dictatorial power. We also wish to assure Kenyans that we remain fully on course in pursuit of electoral justice. Our resistance of dictatorship is resolute and irreversible. We remind the NASA fraternity to maintain our civic and economic resistance. Millions of his supporters were pushing for his swearing-in, an occasion the opposition leader announced on November 28 when police blocked his convoy from accessing Jacaranda Grounds. That day, Uhuru Kenyatta was being sworn in as President at Kasarani. Angry and dejected supporters could not hide their excitement when Raila briefly addressed them along Manyanja Road, when he declared the December 12 D-Day for his inauguration. He said he would be sworn in like Emmerson Mnangagwa, the new Zimbabwean President who was smoothly ushered into office by the military last month. A radical group of youthful politicians are said to be behind the push, with moderates reportedly against the oath-taking idea. Despite the postponement, how he will retain their support and his legacy as a champion of due process remains Raila’s biggest headache. In his recent statements, the NASA leader has been citing the annulled August 8 General Election results as a basis for his claim to victory. Yet in his own petition to the Supreme Court, he had argued that the election was marred by such irregularities as to invalidate any outcome. The Court, on a 4-2 majority, concurred and nullified the election, ordering a repeat in 60 days, which the NASA leader refused to participate in after his irreducible minimum conditions for a credible poll were not met. President Uhuru went ahead to win 98 per cent of the votes cast. He was for all intents and purposes unopposed, with his main challenger out of the race. The turnout was dismal. Analysts have warned that should Raila step forward and take the controversial oath of office, then the events could mark a dramatic turning point for his decorated political career. “He might have lost the electoral war but Raila’s post-election strategy is poised to put Kenya’s democracy, nationhood and sovereignty on the cusp of a new crisis,” warned Peter Kagwanja, a pro-Jubilee strategist and the CEO of the Africa Policy Institute. He said Raila’s push is meant to force talks ‘among equals’ with Uhuru, leading to a caretaker government and a fresh election under a reformed IEBC. “His swearing-in will amount to a civilian coup, which will require willy-nilly the immediate and complete overhaul of the 88-month-old Constitution,” he said. Kenya is holding its breath ahead of the planned ‘swearing-in’ amid concerns that the ceremony may probably turn chaotic and violent if police attempt to disperse supporters. However, Jubilee politicians have advised the police to exercise caution and restraint in dealing with opposition supporters so as not to give Raila political mileage. They believe Raila’s return from the US was mismanaged by the security forces that battled supporters, reportedly falling into Raila’s ploy to make political capital. NASA claim that the police have killed over 200 of its supporters in confrontations since the August 8 polls although police have discounted the claims. Described as the ‘father of Kenya’s democracy’, Raila was instrumental in the agitation for multi-party democracy in the late 1980s and early 1990s that successfully culminated in the end of single-party rule. He holds the record of the longest serving detainee (9 years) among Kenya’s pro-democracy fighters who include his father Jaramogi, Charles Rubia, Kenneth Matiba, Koigi wa Wamwere and Gitobu Imanyara among others. The opposition leader was in 1988 detained for involvement in the push for multi-party democracy, barely months after he was released from a six-year detention on treason charges. Raila had been accused of collaborating with the plotters of the 1982 coup attempt against President Moi’s regime and detained without trial. Almost three decades later, the scion of Kenya’s first Vice President, is finding himself in a similar situation against the System. Attorney General Githu Muigai had earlier last week said the government would invoke Article 40 of the Penal Code should he attempt to take the oath. “What is the punishment for high treason? It is death… No person may claim or exercise State authority except as authorised by the Constitution,” Muigai said. But a visibly angry Raila fired back at the AG, laughing off threats to arrest and charge him with the highest offence against the State. “He misses the point completely. This is blackmail and intimidation. He should know I have been charged with treason before,” Raila charged back. Nasa has demanded electoral reforms ahead of fresh elections in February next year.